In the past, movies about the sport of tennis have ranged from mediocre to bad to ridiculously stupid. I'm talking 2004's Wimbledon, 1979's Players, and 1986's Jocks. Thankfully, Battle of the Sexes (my latest review) is better than the aforementioned. 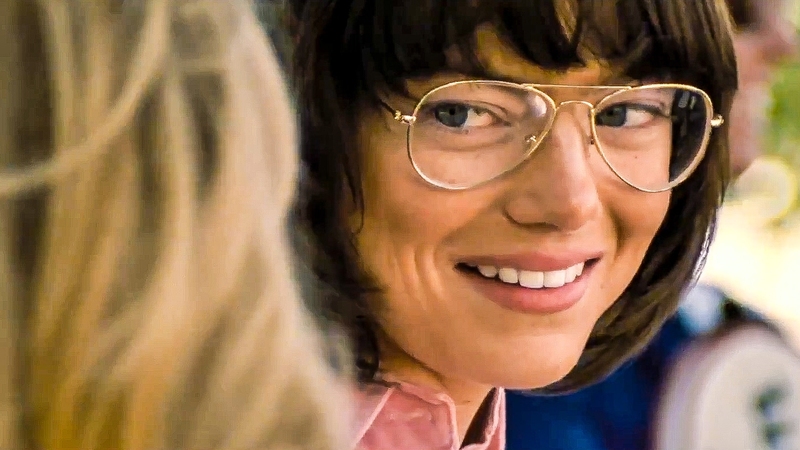 Based handily on a true story, "Sexes" depicts the events leading up to the famous 1973 tennis match between Bobby Riggs and Billie Jean King. Battle of the Sexes also illustrates the match itself. Wooden rackets, short shorts, an audience of 90 million worldwide, a Houston Astrodome venue, it's all there. In retrospect, "Sexes" is a good film but it doesn't quite achieve greatness. It lacks excitement simply because Billie Jean's routing of Riggs was sort of lopsided. All you gotta do is look at the wiki page and know who won beforehand. I was pumped to see this movie based on its meaty trailer with Elton John's "Funeral for a Friend/Love Lies Bleeding" blaring in the background. In the end though, anti-climatic and blase are some of the words I'd use to deduct points from my rating for Battle of the Sexes. I will endorse this flick but it only wins half the "battle". The positives for "Sexes" are obviously the acting of the cast and the direction of Jonathan Dayton and Valerie Faris (Little Miss Sunshine). Emma Stone and Steve Carell are excellent in the leads. They dive into their roles as King and Riggs with veritable aplomb. You also have sturdy supporting work in Sarah Silverman. She goes unrecognizable with the part of Gladys Heldman, the founder of World Tennis Magazine. As for the portrayel of Marilyn Barnett (Billie Jean's hairdresser and secret lover), Andrea Riseborough is all aces (ha-ha) giving a warm and subtle performance. I can't predict the future but I'm hoping that all four of these actors get nods from the Academy come awards time. It's only September so yeah, that may hurt their chances. In regards to Dayton and Faris (mentioned earlier), well they shoot Battle of the Sexes in flask, dream-like state. Their look is grainy and they use plenty of rack focusing. Basically "Sexes" almost achieves the feeling that you're watching something that was actually made in the 70's. The tennis scenes look authentic, the period detail is adequate, the awareness of time and place works, and there's a sense that you're always peering in on any trouper and their woman's lib/male chauvinist situation. Overall, "Sexes" is not entirely about a tennis teeming. It's more a character study and/or a backstory via the lives of Riggs and King in 73'. The outcome of their three sets featuring drop shots, volleys, and lobs, might have changed woman's tennis for the better. But hey, where's the fire here. A positive assessment for me but a muted result at best. Of note: I usually recommend movies that have historical gravity anyway. Rating: 3 stars.